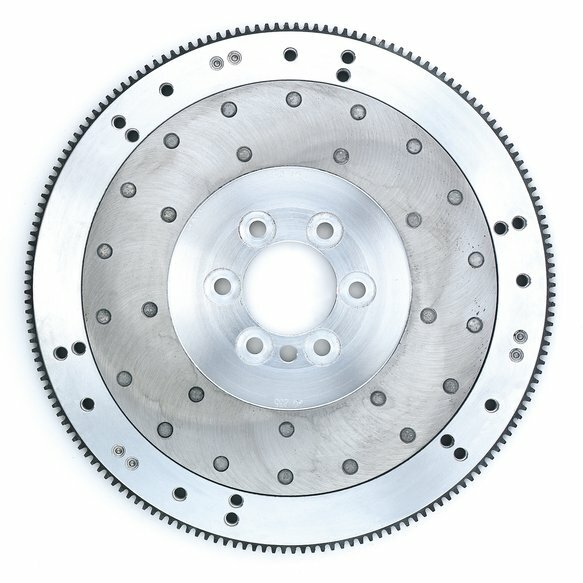 Hays Aluminum Flywheels, the favorite choice of many road racers, are also popular with the serious drag racer running a light car and large cubic inch motor. Machined from 7075 T-6 forged billet aluminum, this high strength alloy surpasses all material specs as to strength and centrifugal distortion. All Hays Aluminum Flywheels feature a replaceable steel or bronze heat shield friction surface and are drilled to accept either the Borg & Beck or Long-Style clutch pattern. The ring gear is securely mounted with welded tabs that are riveted to the flywheel to prevent spinning. Hays flywheels are certified under S.F.I. spec 1.1. Part No. 20-235 is a "Detroit Balance" flywheel, externally balanced to stock (counterweighted) specs. Application: Chevy 1970-90 454 with large bellhousing. Pressure Plate Pattern: Borg & Beck/Diaphragm 10.5" & Borg & Beck/Diaphragm/Long 11", Ring Gear Teeth: 168, Weight: 15.